North Korea wants sanctions relief as corresponding measure, experts say. North Korea has reiterated its demand for “corresponding measures” from the US before it takes further steps to dismantle its nuclear weapons, highlighting a continued divide over efforts to achieve denuclearization of the Korean Peninsula. North Korea’s Foreign Minister Ri Yong-ho said at the 73rd United Nations General Assembly that continued sanctions were deepening its mistrust in the US and there was “no way” it would give up its nuclear weapons unilaterally under such circumstances. “Without any trust in the US, there will be no confidence in our national security and under such circumstances, there is no way we will unilaterally disarm ourselves first,” Ri said, calling for “corresponding response” from the US in return for its “goodwill measures” such as stopping its nuclear and missile tests, and dismantling its nuclear test site in Punggye-ri. In its Sunday edition, North Korea’s state-run newspaper Rodong Sinmun carried a commentary calling it an “irony” for the US to increase sanctions pressure on the North while engaging in dialogue. 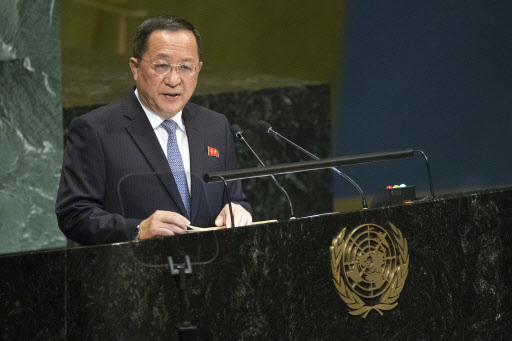 In a keynote speech at the Global Peace Forum on Korea at Columbia University in New York, Thae Hyong-chol, president of Kim Il-sung University in Pyongyang, demanded Washington not only agree to declare an end to the Korean War but also sign a peace treaty with the North, which he called the prerequisites for progress on denuclearization of the Korean Peninsula. North Korean leader Kim Jong-un agreed to permanently dismantle a major nuclear compound in Yongbyon if the US takes corresponding measures, at his meeting with South Korean President Moon Jae-in earlier this month. Ri’s emphasis on the US’ corresponding measures is believed to be part of the North’s efforts to increase its leverage ahead of an upcoming visit to Pyongyang by US Secretary of State Mike Pompeo and a possible second summit between Kim and US President Donald Trump. Pompeo’s trip, which Trump had canceled, citing a “lack of progress” on North Korea’s denuclearization, was reinstated after Pompeo met with his North Korean counterpart Ri on the sidelines of the UN General Assembly. A road map for North Korea’s denuclearization, as well as corresponding measures by the US, are expected to top the agenda of Pompeo’s planned trip to Pyongyang in October and working-level talks between US Special Representative for North Korea Stephen Biegun and his North Korean counterpart in Vienna, Austria. The two countries now appear to have broadened the scope of their discussions beyond an end-of-war declaration, with the North offering to take a bolder denuclearization step — potentially dismantling its Yongbyon nuclear complex — and the US pondering how to reward it. “Dismantling the Yongbyon nuclear complex is not only symbolic but also practically crucial in terms of denuclearization because it would mean the North is giving up its capability to produce any more nuclear material and warheads,” said Hong Min, a senior researcher at the Korea Institute for National Unification. In response, the North appears to want more than an end-of-war declaration from the US — the lifting of sanctions, Hong said. During an interview with Fox News, President Moon cited an end-of-war declaration, the easing of international sanctions against the communist state, exchanges of an art troupe and establishment a liaison office in Pyongyang as possible corresponding measures by the US. “The end-of-war declaration is a measure to give both countries grounds for discussing the easing of sanctions, which is why the North demands it as the first step to build trust,” Hong said. The US, however, has reaffirmed that sanctions will remain in place until the North’s denuclearization is completed, despite Trump and Pompeo striking a positive note on ongoing negotiations with North Korea and signaling “progress” that has not been made public yet. Chairing the UN Security Council on Thursday, Pompeo urged the international community to fully impose sanctions on Pyongyang aimed at cutting off funds for the North to develop nuclear weapons. “Enforcement of Security Council sanctions must continue vigorously and without fail until we realize the fully, final, verified denuclearization,” Pompeo said. Ri’s speech at the UN General Assembly signals the gap between the US and North Korea on who should make a concession first, according to Park Won-gon, a professor at Handong Global University. Talks to follow up on the landmark North Korea-US summit have been in a deadlock over the sequence of the denuclearization process. North Korea has demanded the US declare an end to the 1950-53 Korean War as the first step to end hostilities and build mutual trust, attributing the collapse of past negotiations with Washington to a lack of mutual trust. But the US has been hesitant to do so before the North takes concrete steps to denuclearize amid concerns over the possible impact the declaration could have on the US-led pressure campaign, the stationing of US troops in South Korea and the status of the UN Command here. “It would be difficult for the US to give either an end-of-war declaration or sanctions relief to the North unless it takes more concrete steps to denuclearize, such as dismantling the Yongbyon nuclear complex and accepting an inspection by international experts,” Park said.